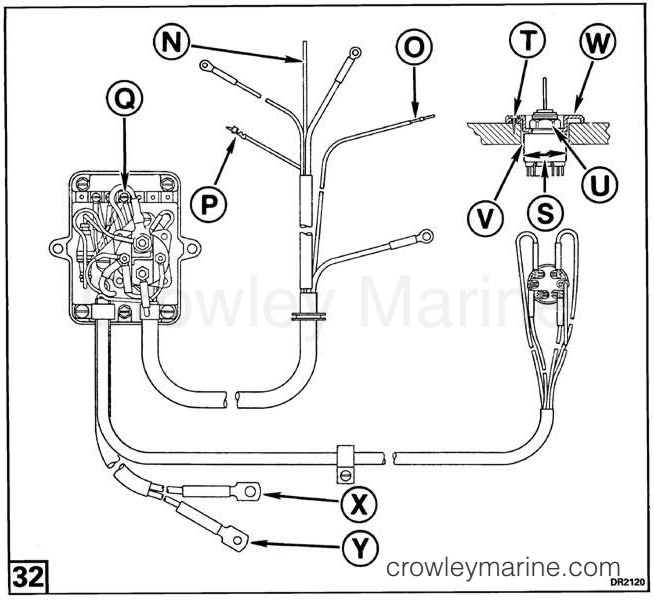 This kit includes all hardware and fittings necessary to convert 1974 thru 1992 (EN) Evinrude® and Johnson® 9.9 and 15 tiller electric models to remote electric starting. This kit should be installed by a trained service technician using current technical literature. These instructions are not intended for consumer use. This kit is intended to be used in conjunction with remote shift and throttle and steering control kits. Refer to the Service Manual and remove tiller handle, throttle cable, and stop switch wiring in preparation for installation. Select a remote control recommended for use with Johnson or Evinrude outboards. Important: Retain these installation instructions with your Owner's/Operator's Manual. They contain installation, adjustment and operating information for future reference. If there is less than 12 in. (305 mm) between the top of the driver's seat cushion and the boat gunwale. Read complete installation instructions prior to starting work. To avoid accidental starting of the engine while servicing, twist and remove both spark plug leads and disconnect the battery cables at the battery. Remove slow speed adjustment knob (A). 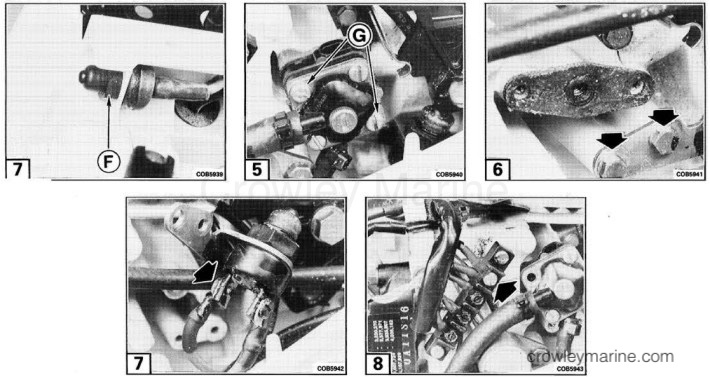 Remove four carburetor air silencer screws (B). Remove two carburetor air silencer base screws. Remove black ground wire (C) from bracket. Remove nut (D) from stop switch (E). Remove nut (F) securing start "button" switch to underside of starboard steering bracket. Remove two fuel pump screws (G) and fuel pump. Remove two neutral start switch bracket screws. Remove red lead from neutral start switch. Remove red lead of neutral start switch from #4 terminal of terminal block. Remove clamp and screw securing battery cable to port stern bracket. Remove start button and cable from engine. 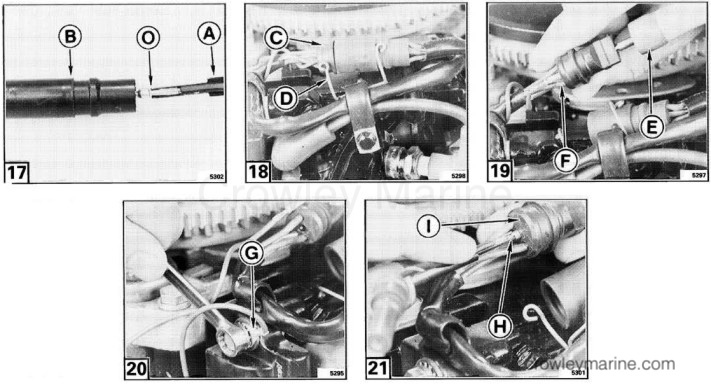 On 1974 through 1976 models only: locate two Packard connectors (H) near fuel pump. Cut black wires (I) 1 1/2 in. (38 mm) forward of Packard connectors. Leave enough wire length on connectors for a splice. 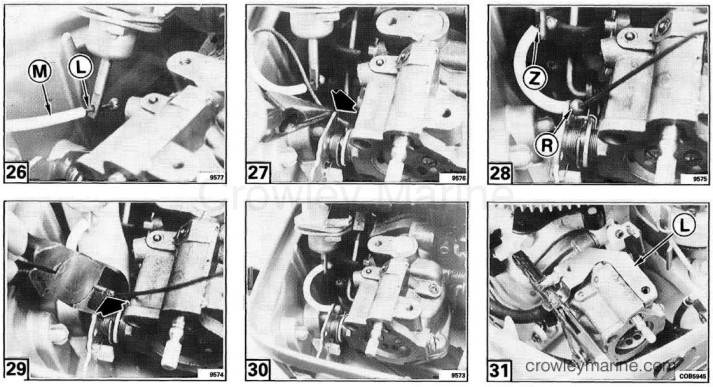 On 1977 and later models: disconnect black ground lead (J) attached at top of ignition coil that comes from stop switch. Remove wire connector (K) from clamp and separate connector. Remove black stop switch lead from connector half using Special Tool P/N 322698. Remove and discard stop switch on all models. Remove choke detent (L). Disengage choke shaft (M) from carburetor choke lever, and discard choke shaft and knob. Feed loose end of new motor cable into lower motor cover through hole formerly used by start button cable. Position grommet in lower motor cover hole. Secure black lead (C) to bracket. Secure #10 gauge red wire to neutral start switch. Reinstall neutral start switch and bracket. Follow procedures in Service Manual for adjusting neutral start switch. Secure #16 gauge red wire to #4 terminal of terminal board. Coat terminal screw with Liquid Neoprene P/N 909570 or equivalent. NOTE: If kit is installed on electric start models not equipped with battery charging, carefully fold back and tape red lead. Route the blue (N) and the black/yellow stripe wire (O) to the starboard side adjacent to the Packard connector (H) and leads cut off in Figure 9. Cut the blue and black/yellow wires off with sufficient length to make splices. Slide 1 1/2 in. (38 mm) heat-shrink tubes over blue and black/yellow wires. Strip, splice and solder wires, blue to one black and black/yellow to other black. Center heat-shrink tubes on splice and shrink. Route black/yellow stripe wire (O) around to rear of motor. (Fold over and tape blue wire (N) out of the way or cut lead off.) Insert black/yellow stripe wire in connector where black stop switch lead was removed, using Special Tool P/N 322697 and following procedure in the Service Manual. Assemble connector halves, attach clamp and secure leads in cable clamps. Route black/yellow stripe wire (O) around to rear of motor. Blue wire (N) is not used on 1985 and later models. Fold over and tape blue wire (N). Using Insert Tool, P/N 322697, (A) insert black/yellow terminal (O) into single lead receptacle (B) provided. Remove and disconnect five lead connector (C) from retainer (D). Using Socket Removal Tool, P/N 322699, (E) remove wire (F) from receptacle. Remove stop switch ground terminal (G) from ground and reinstall screw. Using Insert Tool, P/N 322697, insert single black/yellow stripe terminal (H) into vacant hole of receptacle (I). Reconnect five lead connector (C) and secure into retainer (D). Connect single black/yellow terminal plug and receptacle together (J). Secure with retainer (K). Remove small single wire connector from retainer. Using Removal Tool P/N 322698, remove single black/yellow stripe wire from small plug and receptacle. Using Insert Tool P/N 322697, insert single black/yellow terminal (L) into hole of plug provided. Connect single black/yellow terminal plug and receptacle together (M). Secure with retainer (N). Position solenoid bracket over intake manifold bolt holes and secure with new screws. Slide choke cable (L) through hole of solenoid plunger and install cover (M). Slide choke cable through hole of carburetor choke lever. Install ball stop (R) onto choke cable. With carburetor choke in a closed position, pull slack out of choke cable allowing a 1/8 in. (3 mm) gap (Z) between solenoid plunger and cover. Crimp the ball stop to the choke cable while maintaining the 1/8 in. (3 mm) gap. cut off excess cable. 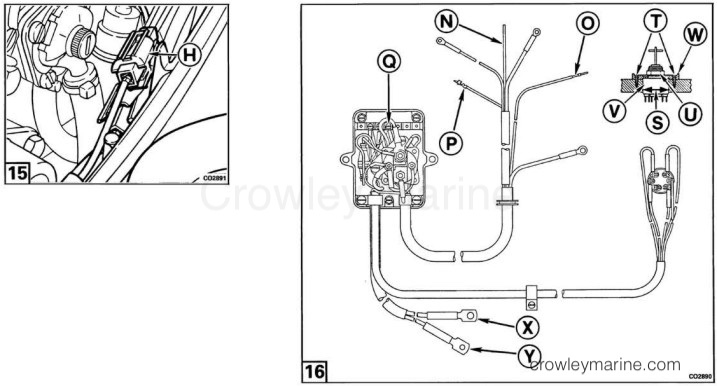 Activate choke solenoid; carburetor choke should be closed. 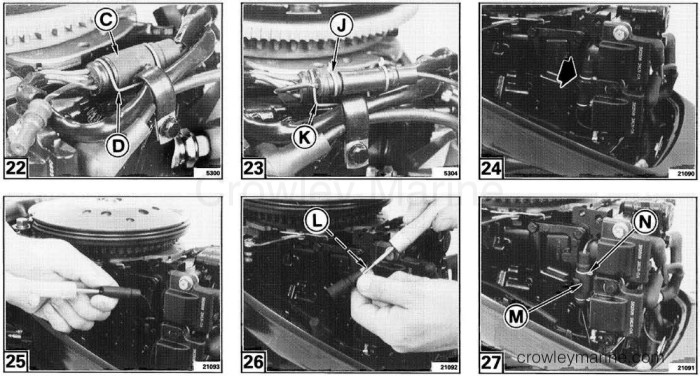 Reposition choke detent (L) onto carburetor. Apply Triple-Guard® grease to new choke shaft and install to carburetor. Reinstall carburetor air silencer. Insert terminal on purple/white stripe wire (P) into Packard connector of choke solenoid. Connect purple/white stripe wire to choke lead. Make sure connectors "snap" together. Insert new choke knob supplied through control panel and connect to carburetor choke lever. Reinstall detent. Reinstall clamp and screw securing motor cable to port stern bracket. Loosen two thumb screws holding box cover to base and remove cover. Remove black #16 gauge wire (Q) from solenoid control terminal and install on number 3 terminal with blue lead. Pick a suitable location in boat for mounting the junction box. Make sure position selected allows full tilting and turning of motor without binding the motor cable or hitting the junction box. Mount junction box base in position selected using three wood screws supplied and replace cover. Position motor cable in an out-of-the-way place, and secure with two cable clamps and screws supplied. Select a position on boat dashboard for the dash panel. Make sure place selected has sufficient clearance behind dash for switches and cables. Use dash panel as a template to mark boat dashboard. Drill one 1 1/2 in. (38 mm) hole (S) for the starter switch and two 3/32 in. (2,4 mm) pilot holes (T) for the mounting screws. Remove nut (U) from ignition switch (V). Route cable assembly from stern of boat to boat dash. Cable should be neatly fastened to boat in an out-of-the-way place. Four clamps and screws are provided for this purpose. Route cable behind dash and pull switches through hole in boat dashboard. Place dash panel (W) over switch and secure with nut. Tighten finger tight. Attach dash panel and switch assembly to boat dashboard with black screws provided. Attach battery terminals to battery cables using screws provided. The battery should be rated 32 ampere hours or better with 200 amperes cold cranking rating at zero degrees Fahrenheit and a 32-minute reserve capacity at 80 degrees Fahrenheit. Battery electrolyte is a strong acid solution and should be handled with care. If electrolyte is spilled or splashed on any part of the body, immediately flush the exposed area with liberal amounts of water and obtain medical aid as soon as possible. Position battery in boat so that cables will have some slack and steering attachments clear when engine is tilted and turned through all positions. A battery box is recommended for mounting the battery. It should have provisions for venting the battery gas which all batteries expel while charging. A 3/16 in. (4,8 mm) hole at each end of the cover is sufficient. The gases emitted by a charging battery are explosive when confined. Battery must be well ventilated. If battery is being charged by means other than the motor alternator, battery should be removed from boat. Charging should be done in an area free from explosive fumes. NOTE: Connect red lead (X) to positive (+) battery terminal and tighten battery terminal with a wrench. Connect black lead (Y) to negative (-) battery terminal and tighten battery terminal with a wrench.